Businesses are challenged to be profitable and productive on a daily basis. In response to this, as well as for other reasons, smart business leaders create a core set of values and a strong strategy to accomplish goals. But what is the difference between companies that are able to actually achieve their goals and sustain success and those companies that do not and fail? The answer, as explained in my book Ruthless Focus, is putting priority on business basics and continually doing them better. By focusing on business basics a company can begin to implement a focused, core strategy. The question then becomes how can a business do their basics better? Below are some practical ways almost any company can improve business basics. A company must constantly analyze its operations. This is done to improve efficiency. If a business does not have a good overview of its entire process, there may be wasted time, money and energy involved in the company’s operations. Are there any products or services that are not profitable? Are there people in the organization that aren’t a good fit or could be in a better position? If so, do something about it. Sam Walton from Wal-Mart was an expert at implementing his core strategy and improving the basics including bringing in talented and knowledgeable people in just the right positions. Another action a company can take is to list some ways the business could change current operations to make a quantum leap in productivity. This is always an interesting activity, as it requires a business owner or CEO to be creative. It can help develop new ways of thinking and doing business. This action is key in implementing a core strategy in a business. Training your workforce well allows a company to impart the core strategy to its employees. It also creates an efficient workforce that allows business to be done quickly and excellently. Continually training employees is important as well. If workers are to stay efficient, they must be up-to-date on their particular job in the company and care about their personal growth. This is especially useful in a time when technical advancement is so rapid. If a company is going to be able to compete, it needs its workers to be continually well trained on all aspects of their job. We cover the Ritz Carlton in Ruthless Focus as having a very structured training program just about on a daily basis. Their success has been sustained for decades. While this introspection requires some vulnerability, it is extremely useful in charting a course forward. Learning from your mistakes ensures that what went wrong will not go wrong again. This can be very useful in terms of implementing a core strategy. Businesses can see where the implementation of the core strategy began to fall apart and can make adjustments and corrections accordingly. While this process does require some vulnerability, as mentioned before, it also helps ensure that a weak link in the chain is removed and replaced with a better one. Toyota is a great example of this when it wanted to introduce the Lexus, it applied lessons learned from the Toyotapet introduction 25 years earlier. Read the full case study in Ruthless Focs. In the end, prioritizing a business becoming better than it was the day before is what will enable a company to understand its competitive differentiations and surface the best core strategy to implement everyday. 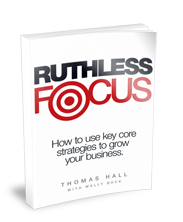 Get a copy of Ruthless Focus.